Tyee Building Supplies Ltd. is located in Prince Rupert’s Cow Bay area, comprising some 30,000 square feet and providing building supplies and other services to communities from Haida Gwaii to Alaska, and as far south as the Central Coast. The Tyee crew’s ability to work together as a team and continuously learn and improve is directly related to the store’s success. It’s the people that make a business a success, and Tyee is very fortunate to have a professional staff, with a solid mix of retail and contractor backgrounds combining to provide a very knowledgeable and diversified team who work together as a family. Tyee’s philosophy is shown by our employees’ continuous improvement and learning, where service to the customer comes first: we treat customers like friends invited into our home. We are also heavily involved in various community projects through interaction and support. Tyee Building Supplies is committed to growing with Prince Rupert and the North Coast as it moves into the future. Tyee maintains strong community involvement all over Northwest B.C. by supporting a number of local organizations. In the spring of 2004 we became a Rona Building Centre. Rona and its suppliers have been very supportive and have assisted us in helping move forward toward a growing future. If you’re ever in Prince Rupert, be sure to stop in at Tyee Building Supplies, the place for building supplies on the North Coast! We have been locally owned since our inception in 1981, and have served the Northwest B.C. ever since. 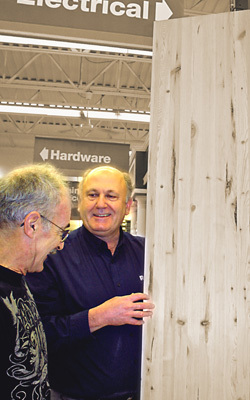 In the spring of 2004, we became a Rona Building Centre. Come visit us at 405 3rd Ave. East in Prince Rupert, or give us a call at (250) 627-7011. To see more contact information, click here.